Living in an App Store world: what are the implications? A few recent events prompt some reflections on the rise of app stores and the implications for developers and for the IT industry. One is Apple’s OS X Lion release, available only through the Mac App Store; and the removal of the optical drive on the Mac Mini, making it hard to install shrink-wrap software. Another is Adobe’s closure of its InMarket service and AIR Marketplace app store. Some app stores are doing better than others. … publishers may no longer provide links in their apps (to a web site, for example) which allow the customer to purchase content or subscriptions outside of the app. Enforcing this on an app such as Kindle promotes Apple’s own iBooks app and store. Apple iOS and Mac App Store – arguably two different stores, but since you access them with the same account I bracket them together. Google Android Market – not a lock-in like Apple’s store, but still the primary store for Android. Windows vNext marketplace – how this will work is not yet public, but the existence of a new app store in Windows 8 is widely rumoured and might be expected to tie in with what is already in place for Windows Phone 7. Perhaps I am overstating the importance of the Windows 8 marketplace, given the failure of the Windows Vista marketplace, but given that Apple has now shown the way I find it hard to see how Microsoft can fail with this one. Note that an app store is not just a marketing ploy. It is a software deployment and update tool. App Stores score well in terms of usability. Another advantage is that users have a centralised mechanism for software updates, managed by the operating system. That is good for security, because it is unlikely to be disabled, and good for usability as it should mean fewer third-party updaters like those from Adobe, Oracle Java, Symantec and others. App Stores typically enforce certain conditions on developers. In essence they must be well-behaved. For examples, the Mac App Store prohibits apps that request escalation to root privileges. Apple also rejects apps that use “deprecated or optionally installed technologies”, including specifically Java and by implication Adobe Flash or other runtimes. This is great for security. In principle, if you decide that you will only install apps from the App Store, you can be confident that all your apps are well-behaved. On the Mac this is interesting; on Windows it would be a revolution. What are the business implications though? First, it is a significant source of new revenue for the operating system vendor. It gets a cut of everything. Second, it gives tremendous empowerment to user ratings and reviews. On iOS or Android, if you want an app, you automatically search the app store and take note of factors such as user ratings and popularity. Most of us can figure that if there are few ratings or reviews, the app is not popular. If you are a software company, getting high ratings and good reviews on app stores is now a key challenge, even more so than it is already with the likes of Amazon. Speaking of Amazon, the third point is that app stores will not be welcomed by software resellers. They are simply being bypassed. Amazon is addressing this with its own App Store for Android; but can it really win against the official Google Android Market? Its MP3 store is better value than Apple’s iTunes, but has smaller market share. Amazon has other business to fall back on, but specialist software resellers will be watching the growth of app stores nervously. Apple resellers in general are already hurting and diversifying, thanks in part to Apple bypassing them with releases like OS X Lion. The app store revolution is good for users in many ways, especially as prices seem to end up lower than before, but there are worrying aspects. In particular, the ability of the operating system vendor to tilt the store in its own favour is a concern, and we will hear more complaints about that. Finally, it is interesting to speculate how this may impact enterprise software deployment. Will Microsoft aim to link its forthcoming Windows app store to other deployment mechanisms such as System Center Configuration Manager? What about volume licensing sales, will resellers be able to keep hold of those? Maybe we will learn more of Microsoft’s story on this at the Build conference in September. Apple and Adobe appear to have a difficult relationship, as shown by Apple CEO Steve Jobs with his Thoughts on Flash last year. Now it seems that there are issues for users of some Adobe products if they upgrade to the new version of OS X, Lion, just released. Adobe and Apple have worked closely together to test that Adobe® Creative Suite® 5 and CS5.5 suite editions and individual products run reliably on Intel® based systems running Mac OS X Lion (v10.7) with optimal performance and user experience. Adobe Flash® Catalyst® CS5.5 and Adobe Flash Builder® 4.5 software are generally compatible with Mac OS X Lion; however, we have discovered issues that may degrade the user experience or affect use of the products. We do not recommend that these customers upgrade to Mac OS X v10.7. Flash Catalyst CS5 and Flash Builder 4 will not work on Mac OS X v10.7. Adobe does not intend to update either of these products for use on Mac OS X v10.7. It is recommended that customers using these versions not upgrade to Mac OS X v10.7. Flash Builder and Flash Catalyst are dependent upon a number of foundational technologies provided by third parties that are not yet fully compatible with Mac OS X v10.7. As these foundation pieces are certified on Lion, Adobe plans to undertake additional testing and issue a compatibility update to our products if applicable. It would be good to know what these components are and whether there are real problems, or possibly Adobe is just being cautious. In other cases, such as Adobe Reader, Acrobat and LiveCycle applications that utilize functionality like forms, digital signatures, portfolios, guides, 3D, extended PDFs and rights management, viewing a PDF inside the browser with the Adobe Reader or Acrobat plug-in may be required, and thus this workaround will not be successful. Acrobat Reader plug-in and Acrobat plug-in are dependent on the WebKit WebPlugin API and capabilities that were unique to Safari. Other browsers like Firefox, Chrome, or Opera do not have the required functionality to run the plug-ins properly. The suggested solution is not to upgrade to Lion. Flash Player may cause higher CPU activity when playing a YouTube video. Possibly related to disabled hardware acceleration. Update: Adobe now says hardware acceleration is OK on Lion. In addition, if you right-click Flash content in the browser, you will find that the settings do not respond to mouse clicks. This went smoothly, Dreamweaver 5.5 opened and seems to work fine. Apple gives up on Xserve dedicated server hardware – looking towards the cloud? 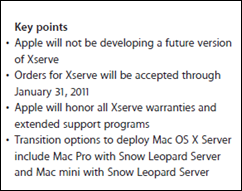 Xserve will no longer be available after January 31, but we’ll continue to fully support it. To learn more, view the PDF. 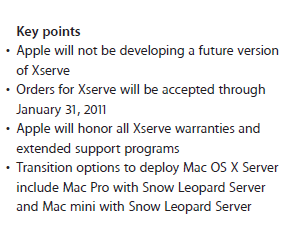 However, the Snow Leopard Server, a version of OS X tuned for server use, remains; and Apple suggests that you install it either on a Mac Pro or on a Mac Mini. That’s all very well; but while a Mini might well make sense for a very small business, larger organisations will not be impressed by the lack of features like dual redundant power supplies, lights out management, and rack mounting, which the Xserve provides. There are a couple of ways to look at this. One is that Apple is giving up on the server market. Largely true, I think; but my guess is that Apple realises that this type of on-premise server is under threat from the cloud. I do not see this as Apple giving up on corporate computing; that would be unexpected considering the gains it is making with Mac, iPhone and iPad. I do see this as a move towards a client and cloud, or device and cloud, strategy. In that context it is not so surprising. That said, I imagine there are a few businesses out there focused on supplying Xserve-based systems who will be disappointed by the news. I’ve not used one myself; but from what I’ve heard it is rather good. This is not altogether a bad thing for Java. Waiting for Apple to update its official version has been a frustration for Java developers on the Mac. If Oracle now takes responsibility for delivering the JVM for OS X, it may keep in step. Unfortunately there is not currently an Oracle JVM for OS X. Nor does the open source Apache Harmony support it. In the light of Apple’s announcement I imagine both may address this lack; though a further complication is that IBM has recently abandoned Harmony in favour of the Open JDK. 3.3.1 Applications may only use public APIs and frameworks included in the default installation of Mac OS X or as bundled with Xcode as provided by Apple, deprecated technologies (such as Java) may not be used. I doubt Apple will ever attempt to lock down desktop OS X, iPad-style. But I think we will see strong encouragement from Apple steering users towards App Store installs. There will be hints that it is safer and better, the true Mac way to get apps onto your machine. Remember the early days of Java? One of the reasons it won support was that it reduced the industry’s dependence on a single vendor and its operating system. Plenty to think about as Apple increases its market share.